Rob Starkman dreams that one day, athletes everywhere will wear his socks. 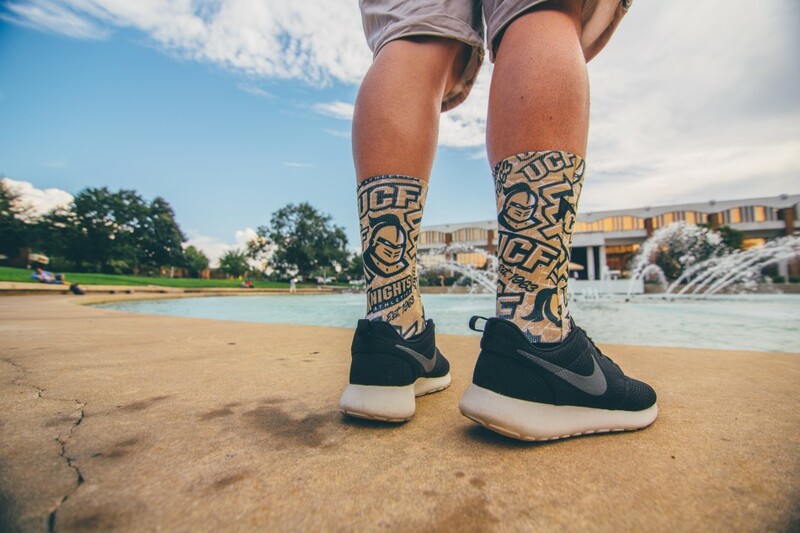 Not the ones in his sock drawer – the former UCF student is talking about the socks produced by Rock ‘Em Apparel, the company he launched in his college apartment. That was four years ago, and now the business has brought in more than $1 million in revenue each of the last two years and has four UCF alumni and two current students on its payroll, Starkman says. The company recently released its product line for Knight fans, as well as lines for Gators and Seminoles. “We’ve been very fortunate to grow very massively very quickly,” said the 25-year-old, who spoke recently to a group of budding entrepreneurs at the Blackstone LaunchPad in the Student Union. Rob Starkman shares insight about his company with UCF students at Blackstone LaunchPad. Starkman didn’t set out to start a business. He was student manager for the UCF men’s basketball team for four years. Initially, Adidas held the exclusive contract to supply apparel for UCF athletics. That relationship ended in 2009 when basketball player Marcus Jordan wore his famous father Michael Jordan’s Nike shoes on the court. UCF signed with Nike a few months later, and the basketball team began wearing the company’s gear. But Starkman thought the company’s basic black-and-white socks didn’t show enough Knights spirit. He bought dye at a department store and turned the Nike socks black and gold. The players loved them, and fans began to take notice, too. Starkman, then a communications student, listed some of the socks on eBay and saw them snapped up quickly. Rock ‘Em Apparel now has seven employees, not including Starkman. Four are UCF alumni – Austin Crane, Josh Netterstrom, Mike Pacini and Steve Rollins, all 2013 graduates – and two others, Colin Cleven and Justus Griffith, are currently enrolled at UCF. The company based near Mall at Millenia makes socks using its own dyeing process that’s capable of producing crisp, intricate designs. It’s branching out into other apparel, as well. Rock ‘Em Apparel has a growing following, including a social media audience of more than 600,000. 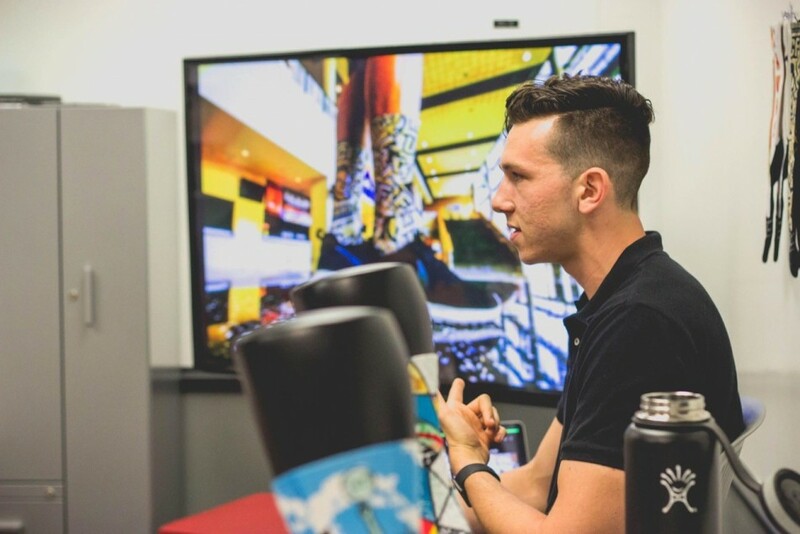 The company has done custom sock projects with ESPN, Red Bull and Champs Sports, as well as professional, collegiate and school teams – including producing the NBA Championship socks for the Golden State Warriors. In addition to its online store, Rock ‘Em socks are sold in the Magic team store, and the Gator, Seminole, Knight Fever memorabilia store in College Park. Starkman is talking with national retailers with an eye toward further expansion. That goes for on the field, too. “Ten years from now, I want every piece of clothing worn by UCF athletes to be Rock ‘Em Apparel,” Starkman said.